A high-lather, creamy 100% natural soap made from organic vegetable oils. 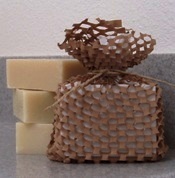 No perfume or additives, has a lovely soapy scent. Great for sensitive skin; use on hands, face and entire body. Also try our 100% natural laundry powder from the same soapmaker! A mix of finely ground castile soap, baking soda, borax and washing soda, this gentle product is great for whites or colors, and can be used in HE, front- and top-loading machines. Only one tablespoon needed for ordinary loads (use more for large or soiled loads). Now this will be a surprise to many! 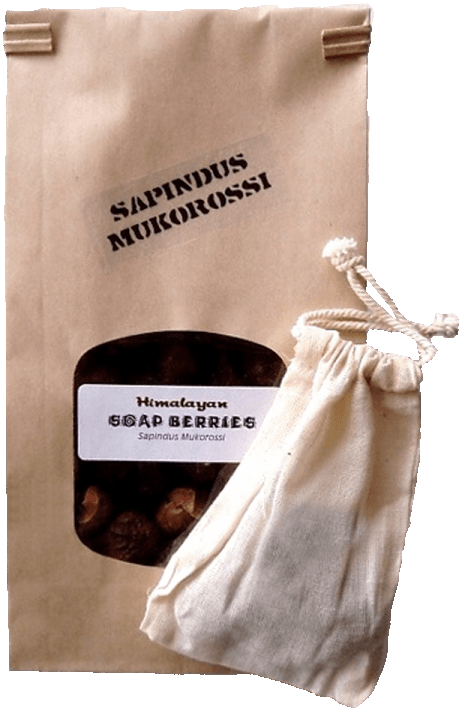 Be free of laundry detergent forever...the dried berries of the Sapindus Mukorossi tree will wash your clothes better than anything else! Just toss a few in your wash water (tied in a little sack) and enjoy nature's removal of soil and odors, plus fabric softening. It's hard to believe, but they do work, and the result is truly fresher and cleaner than commercial products. Great for those with allergies or sensitivity to chemicals and fragrances. An 8-ounce bag does well over 100 loads! 100% botanical, grown wild, no additives or chemicals, premium size, compostable. Liquid soapberry extract - 18X concentrated! Dilute for household cleaning or use straight (1/2 to 1 teaspoon) in your washing machine for laundry. This handy concentrate is simply the surfactant extracted from dried sapindus mukorossi berries and can be used in all kinds of creative ways (even bathing pets) if you want a natural, chemical-free alternative to the usual stuff! No dyes or additives, purely botanical in origin. 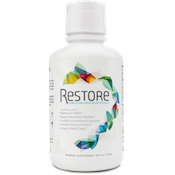 Great for allergies or sensitivities. From a very small producer, these all-natural, extremely fresh-smelling household cleaners might quickly become your favorites. Non-toxic and alcohol-free, just spray and wipe for quick deodorizing and cleaning. Made with organic tea-tree and essential oils, vinegar, distilled water and great care! Available in Lemon and Lavender scents, with an additional 8-ounce concentrate for refills. Glass container with sturdy spray pump. Are you cold at night? In the old days a bedwarmer was a pan of coals. 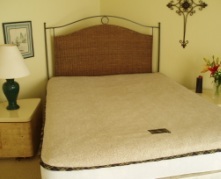 Today it's a warm fleece underblanket that makes your bed cozy and toasty and yummy and soft! No electricity, no electromagnetic fields, sleep without heating your room. A novel creation that solves the problem without electricity, using your own body heat! The bedwarmer is a fluffy mat that goes below your bottom (fitted) sheet and recycles all your warmth right back to you. Made of synthetic polyester fleece, our bedwarmers are machine washable and can be tumble dried to fluff up again - they last for years! Cheaper than sheepskin mattress pads ($600+) and styled for all bed sizes - get them for the whole family and save on your heating bill! Combined with flannel sheets and a hot water bottle...nothing like it! Price starts at $69, click here to view and buy. Get comfortable, relieve pain, put your spine in proper alignment!